SUN VALLEY, ID--(Marketwired - July 09, 2013) - ESS (Eye Safety Systems) today announced the release of its new Rollbar™ ballistic sunglass with interchangeable lenses. The aggressively styled Rollbar™ delivers advancements in fit, form, and function by providing users with quicker lens exchanges, enhanced lens retention, and improved integration with headborne devices. The result is Made in USA eye protection that is built to excel in extreme tactical conditions, but perfectly suited for shooting sports or other recreational activities. Rollbar™ sunglasses come standard with two sets of interchangeable, high-impact polycarbonate lenses: Smoke Gray lenses for daytime use, and Clear lenses for indoor or nighttime wear. The rapid lens exchange is accomplished via the auto-locking Rollbar Lens GateTM, an easy-to-use mechanism designed to expedite lens swapping and ensure superior lens retention under impact. The Rollbar's wide peripheral vision and distortion-free lenses help ensure maximum performance with minimal eye strain. A streamlined ergonomic fit provides superior comfort and optimal compatibility with hats, helmets, hearing protection, and communications devices. "Like its predecessors, the battle-proven CDI and CDI MAX, the Rollbar provides the protection and rapid adaptability critical for use in hostile environments," noted Brian Ross, ESS General Manager. "This is full-fledged military eye pro, wrapped in a modern sport sunglass." A range of accessory lens colors will soon be available, making this sunglass adaptable to any light condition. The Rollbar™ can be worn by a wide range of users, accommodating anyone with medium to extra-large fit requirements. As with all ballistic eye pro purchased from ESS' secure shopping site, www.esseyepro.com, the Rollbar is backed by a 30-Day Try-on-For-Fit Guarantee, a Five-Year Warranty, and the industry's only Lens Contingency Program™. 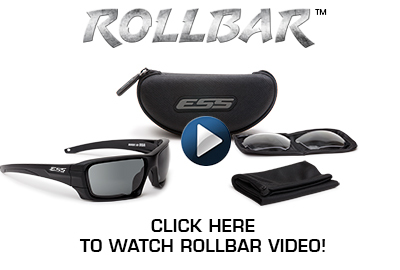 Rollbar™ sunglasses are compliant with U.S. MIL-PRF-31013 (Clause 3.5.1.1), ANSI Z87.1-2010, and U.S. Federal OSHA. All Rollbar™ lenses provide 100% UVA/UVB protection. About ESS: Established in 1998, ESS (Eye Safety Systems) creates advanced eye protection systems for military, law enforcement, and fire/rescue professionals. Designed for the planet's most hostile and unforgiving environments, ESS products feature cutting-edge technologies and patented innovations to ensure peak performance and uncompromised eye safety. Headquartered in Sun Valley, Idaho, ESS is a wholly-owned subsidiary of Oakley, Inc. ESS eye pro is manufactured in Foothill Ranch, California, and is sold in over 100 countries. For more information, please visit www.esseyepro.com.